I’ve got myself a dotted notebook again. While I have no problem drawing over lines on a page, the dots I find hard to ignore. 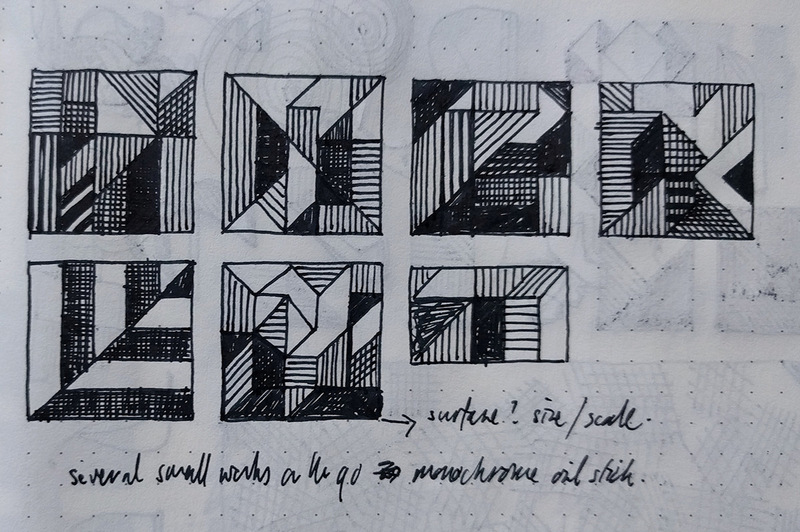 Unlike a plain page, where anything goes, the dots encourage doodles of boxes, diagonals and straight lines. From these drawings I’m beginning to explore similar structures in paint – just to see what may be possible (or not). As you know, paint on the end of a brush behaves quite differently from a 0.5mm ink pen on paper so there’s a translation of sorts to be negotiated. Scale, surface and colour all come into play too but for now, to keep things simple, I’m sticking to mixing only black and white on a small mdf panel.